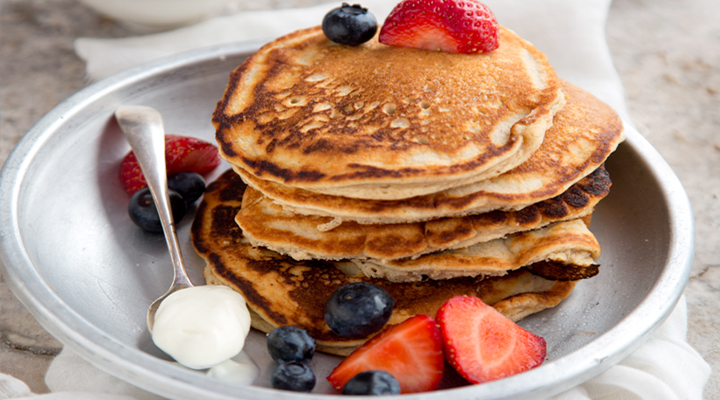 These pancakes are a great high-protein breakfast or snack option. 1. Blend the eggs, milk, protein powder, coconut flour, cinnamon, baking soda, vanilla, vinegar and salt together to make a batter. 2. Melt the coconut oil in a non-stick frying pan set over a medium high heat. Using a ladle, pour small amounts of batter into the hot pan. Cook the pancakes in batches for 3 minutes on one side, until bubbles start to form on the surface, then flip over and cook for a further 30 seconds. and a sprinkle of cinnamon. Tip: Small pancakes are much easier to flip. Once they get too big, things can get messy!